A brief recap: I have succeeded in my first objective of supplying an existing FOB with two truckloads of supplies. 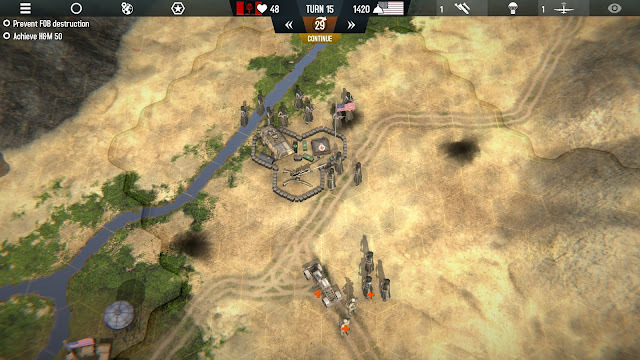 I now need to push up my Hearts and Minds score while defending the FOB. 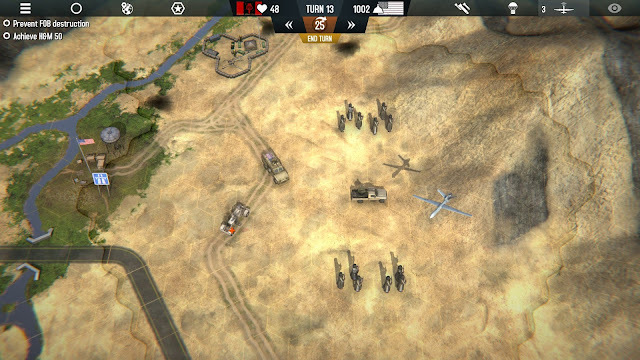 The FOB is loaded with troops and supplies, but is still quite isolated from HQ. After taking a few dings in recent turns, I'm in the negative on Political Points (PP) and can't do much. I figure I will slow things down for a few turns and try to consolidate my position. Units can be sent back home to regain some PP. I'm forced to send home an Apache attack helicopter to shed some of my PP debt. I need to get back in the positive quickly in case an emergency crops up, and I have need of the special abilities like airstrikes or supply drops. Sending vehicles ahead without mine sweeper support is dangerous. I send a transport loaded with some ANA soldiers down south to visit the friendly village there. Since it is far from the mountains, I decide to risk sending it racing ahead without mine sweeping operations going first. My Husky minesweeper was already damaged by some roaming Taliban. 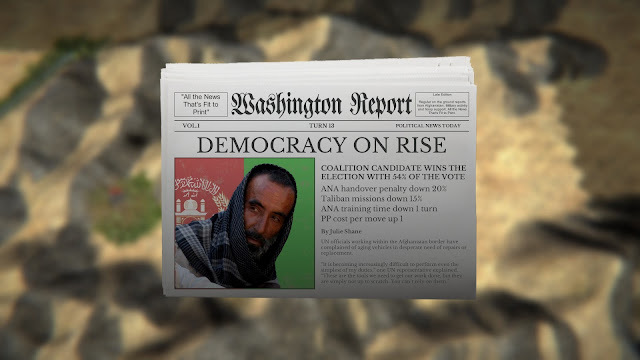 Unfortunately, the ANA troops hit an IED, which ruins their whole day. Now I have two vehicles damaged and exposed. I can't risk sending the Husky back to base without scouting the area, so I launch my recon drone. It's not a pretty picture, a total of FIVE Taliban units are hanging around in the area. 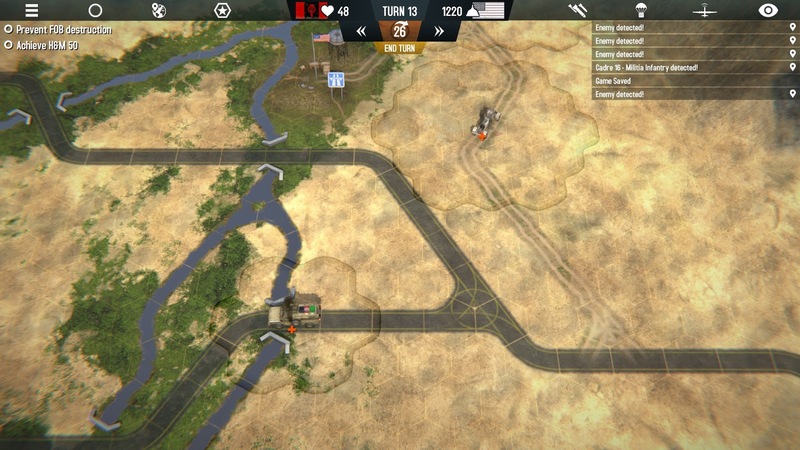 I hit the Taliban with artillery, airstrikes, an Apache, and mechanized infantry. My ground forces take a couple of hits, but the Taliban are either destroyed or on the run. Now to get everyone back to base to recover. Uh-oh, that was just the beginning. 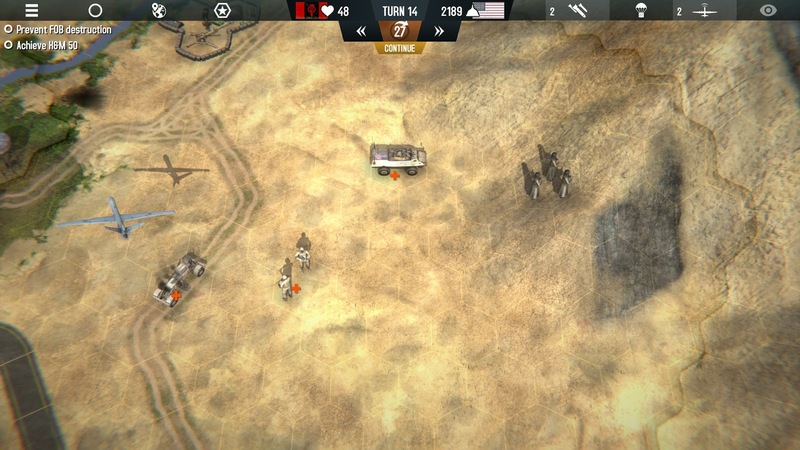 Before my forces can get back inside the FOB, another swarm of Taliban units appear and surround the base. 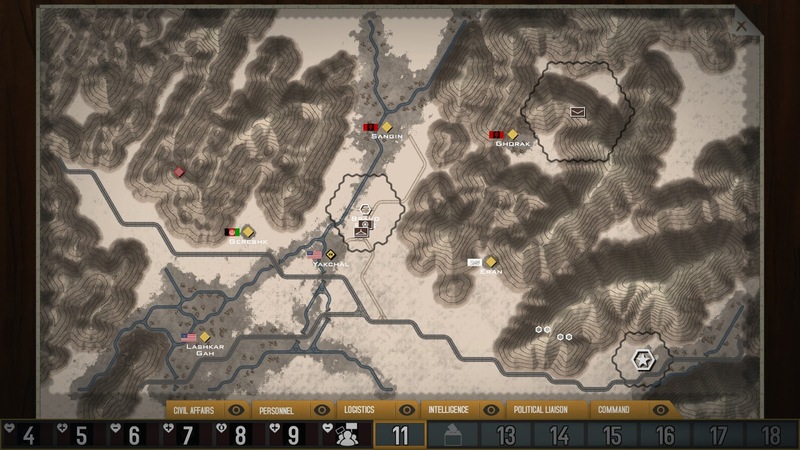 Artillery hits them again, and more coalition ground forces join the fight to hold the FOB. Taliban defeated, but we have many wounded. I'm able to push the Taliban back again, but I have a lot of wounded soldiers. 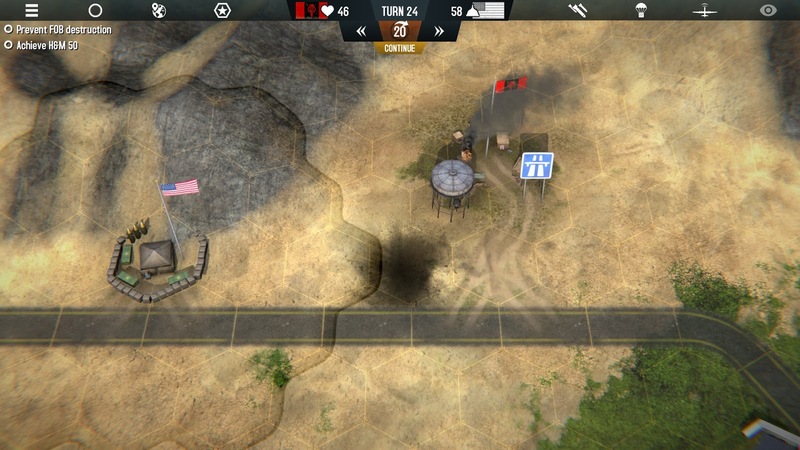 I use the engineers on hand to add a field hospital to the FOB so that my infantry can be healed up to full strength. 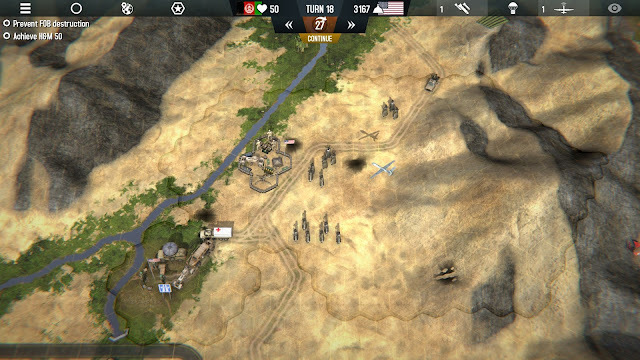 On the next turn I organize and dispatch a small convoy to head west across the river and build a new FOB. They leave just as another wave of Taliban fighters moves against the FOB. Oh, come on. Right now? 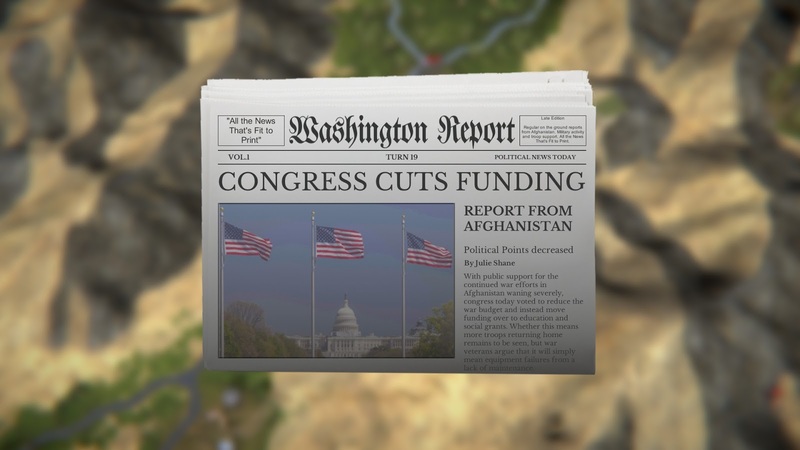 Congress, in its infinite wisdom, decides to cut off funds even as the fighting rages here on the front lines. The area around the FOB is looking pretty scorched after constant battle. 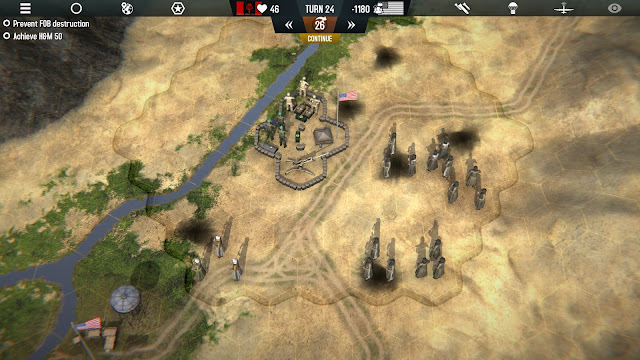 Once again, my forces are able to beat back the Taliban. 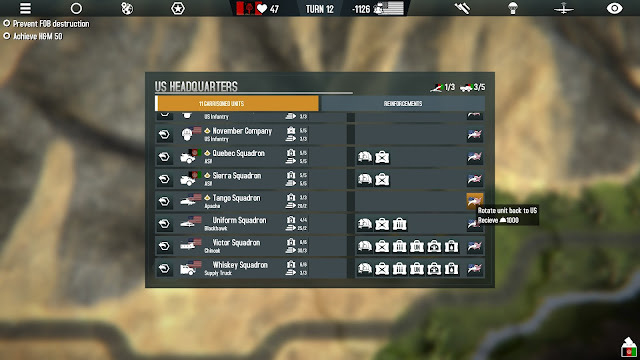 My convoy sent west encounters no resistance and manages to set up a new FOB. Things are looking good! 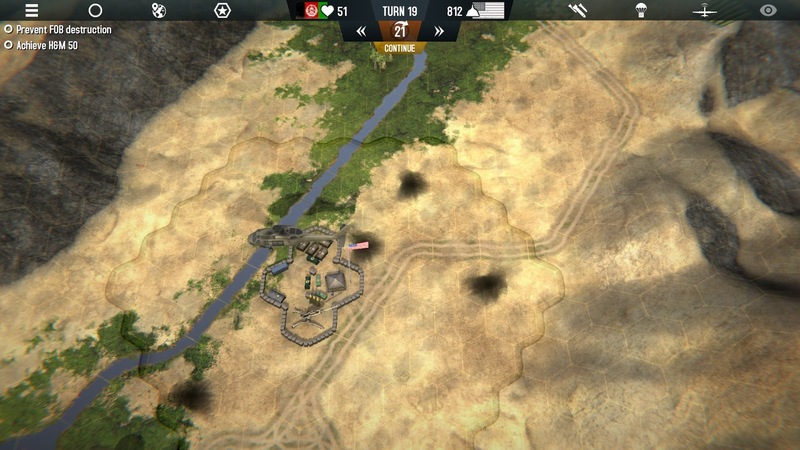 The enemy gives me a few turns of relative peace, and I use the opening to deploy some troops to the nearby villages, knock out a couple of opium fields, and fly in additional artillery ammo to the FOB. However, the relief does not last long, another large wave of Taliban insurgents appears around the FOB. Although things had been going quite well at the western FOB, somehow an enemy group slipped in and planted an IED just outside the line-of-sight of my FOB. An already wounded infantry unit sent on a routine trip to the village was hit and destroyed. 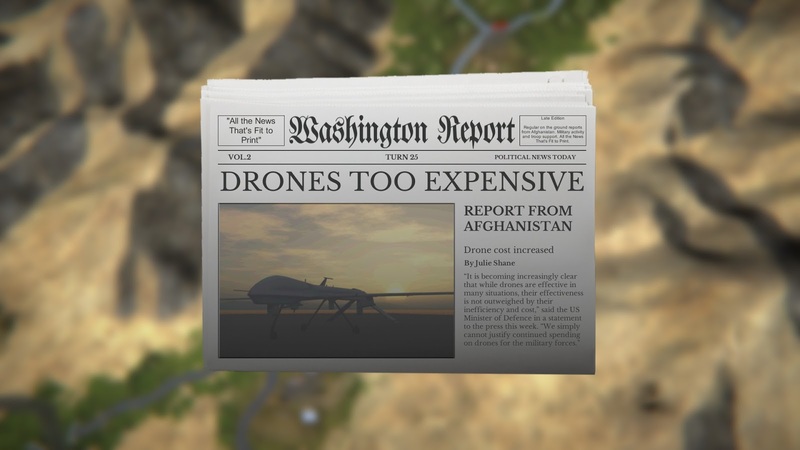 My recon drones will now be more expensive to deploy. I did not have much luck with events during this scenario. The western FOB is now threatened as well. 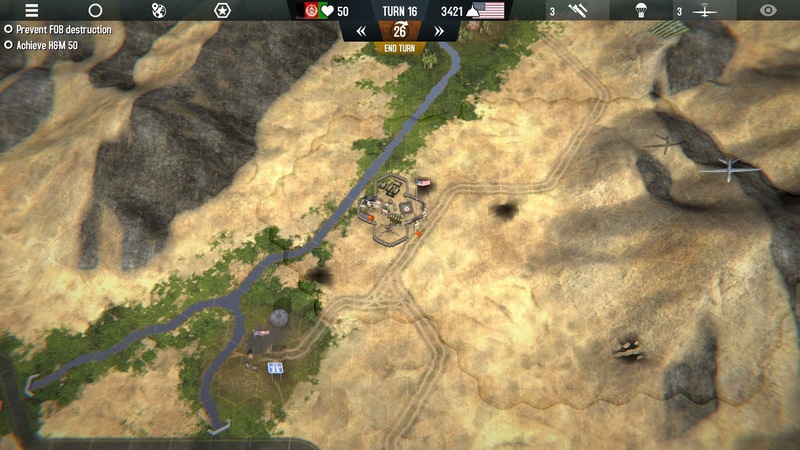 Attacks on the central FOB continue, I lose another helicopter to RPG's, and now my western FOB is surrounded and has no infantry available to defend it. I also ran into several annoying bugs that I did not encounter during the first portion of this AAR. As my score begins to slip further and further from reach, I decide to call it quits for now. I conceded defeat. I look forward to playing a more updated version of this game, and will give it an in depth review on or right after the March 23rd release. There are a lot of good things going on here, but as you can see, the very first scenario out the gate is quite difficult to even survive, much less win. The balance currently feels a bit off. I was hesitant to ever send my regular US infantry into combat with Taliban fighters, since they had an almost even chance of losing. The ANA infantry had even worse odds. This meant I only had a few options for attacking the enemy, and there were a LOT of enemies around. I'm still very much a novice at the game, so maybe the balance is fine and I'm just not approaching things correctly. There were also more than a couple of bugs, but that's to be expected at this point. I imagine most have already been ironed out and will be patched soon. 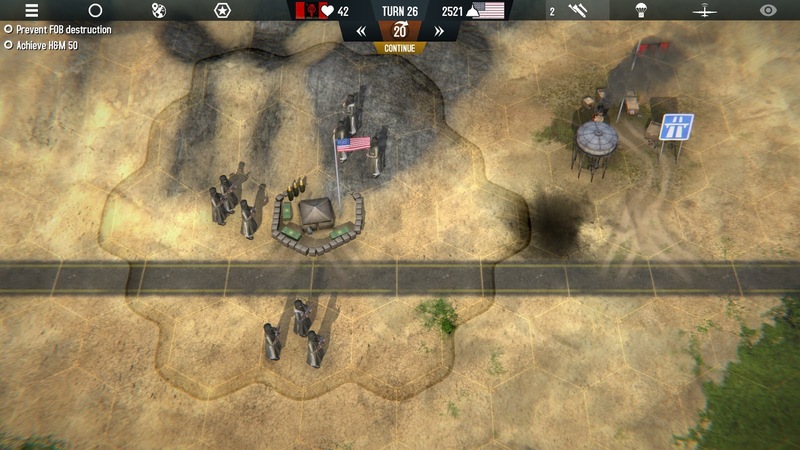 My favorite was a Taliban unit that survived being shot at by an Apache, ran around the perimeter of my FOB, shot an RPG at the helicopter, then teleported a half-dozen hexes away, turned and fired back at the FOB, blowing up a supply truck, then disappeared into the fog of war. Those guys were just a little over-powered, I have to say! I anxiously await the final version of the game, and look forward to giving it a full review sometime next week. Although this match ended in a frustrating way, it still did a great job of capturing the frustrations of the real conflict. There is a constant struggle to achieve multiple goals at the same time with limited resources.